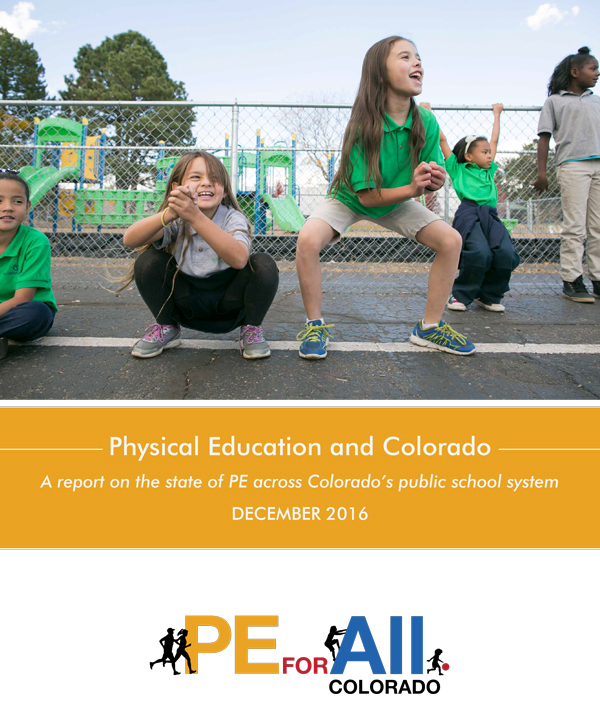 A report released today by the PE for All Colorado Coalition outlines the importance of quality physical education for all students and identifies serious challenges in determining whether students are receiving equitable instruction. The report identifies the need for physical education as part of an overall education as well as catalogues the difficulties of determining whether Colorado students are getting equitable access to physical education across the state’s 178 school districts. An active lifestyle that includes adequate physical activity can increase a child’s chance of success. Supporting increased physical activity and physical education for all children will help ensure that future generations reach their full potential. One key to increasing physical activity and wellness across the lifespan is to make physical education part of every child’s complete education. The PE for All Colorado Coalition was formed to increase and improve physical education in Colorado schools. Coalition members represent a broad and diverse group of organizations committed to the concept that physical education is an essential building block for ensuring healthy, successful children and adults and thriving communities.